Below is a comprehensive list of hotels in Carsington Water. Use the sort links to refine your search or to find featured accommodation in Carsington Water. Many of our hotels in Carsington Water feature no booking fees and best price guarantee when booked through the Pictures of England website. To list your hotel in Carsington Water, click here. Wisels is a holiday home set in Carsington, 36 km from Nottingham. The property features views of the garden and is 37 km from Sheffield. The unit eq..
Spring Cottage is a holiday home located in Carsington, 32 km from Nottingham. The property is 38 km from Sheffield and boasts views of the city. Free.. Featuring a barbecue, Green Farm Stables is a holiday home set in Hognaston. The unit is 36 km from Nottingham. Free WiFi is featured throughout the p.. The Garden House is a holiday home with a garden, set in Atlow in the Derbyshire Region. The unit is 35 km from Nottingham. Free WiFi is featured thro.. The Glass House is situated in Atlow, 35 km from Nottingham and 41 km from Sheffield. Free private parking is available on site. The rooms are fitted.. Featuring a garden, West Bank is a holiday home situated in Kniveton. The property features views of the garden and is 37 km from Nottingham. There i..
Manystones Barn offers pet-friendly accommodation in Carsington, 36 km from Nottingham and 33 km from Sheffield. The unit is 22 km from Derby. Free pr.. The Briar is a holiday home located in Middleton, 30 km from Nottingham. The unit is 39 km from Sheffield. Free WiFi is offered throughout the propert.. Situated in Kniveton, this holiday home is located 38 km from Nottingham. It provides free private parking. An oven, a toaster and a refrigerator can.. Situated in Kniveton in the Derbyshire Region, this holiday home features a garden with a barbecue. The property features views of the garden and is 3.. 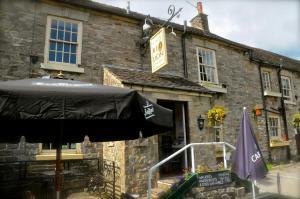 The Red Lion @Kniveton is located in the picturesque village of Kniveton, in the outskirts of the Peak District National Park. Set in a historic liste..